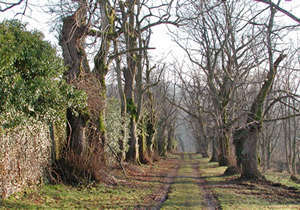 This old field, occupied until the end of the XVIIIth century by the monks, was a vast shaded property of secular trees with arranged alleys. Before 1914, it was a favorite place of walks. The chidren at the exit of the schools ran in the large alleys. Village fairs, a ball with the locality of the ”Round Not”, attractions open, animated Sundays afternoon. After 1945, this space of greenery was derted little by little before being again attended by the samiellois but also the visitors of passage. The storm of 1999 unfortunately disturbed the quietude of the places but of new plantations let foresee a green future.